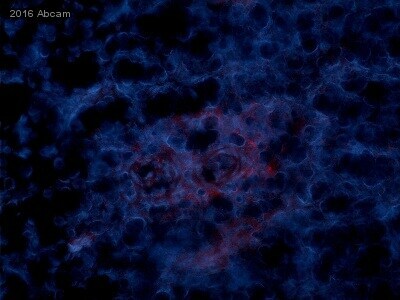 This antibody has been found to work on mouse samples in WB but not IHC. Synthetic peptide within Human CD86 aa 1-100 (N terminal). The exact sequence is proprietary. WB: Raji cell membrane lysate. 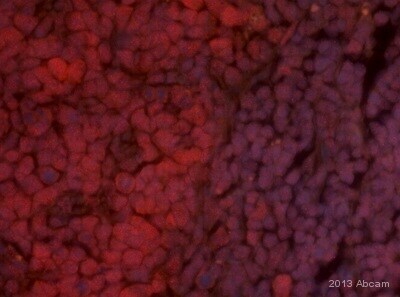 IHC-P: Human tonsil tissue. ICC/IF: Raji cells. We would like to suggest as alternative ab239075 for WB and ICC applications and ab243887 for IHC-P application. Our Abpromise guarantee covers the use of ab53004 in the following tested applications. WB 1/5000. Detects a band of approximately 70 kDa. 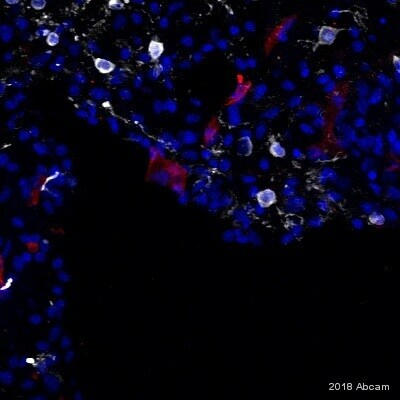 Immunohistochemistry (Formalin/PFA-fixed paraffin-embedded sections) - Anti-CD86 antibody [EP1158Y] - N-terminal (ab53004)Hernandez et al PLoS One. 2014 Jun 5;9(6):e98458. doi: 10.1371/journal.pone.0098458. eCollection 2014. Fig 1. Pattern of macrophage infiltration in colorectal cancer and healthy surrounding tissues. The immunoreactivity to CD86 (M1-MF marker, C–D) was analyzed in colorectal cancer (Panel D) and healthy surrounding mucosa (Panel C) using ab53004. Serial sections (4 µm) of samples containing tumor and normal mucosa from each patient were stained. Endogenous peroxidase activity was suppressed by immersion in 0.3% hydrogen peroxide. Once blocked with 5% horse serum, sections were incubated overnight (4°C) with the primary antibody. A horse anti-mouse/rabbit biotinylated antibody 1∶200 was used as a secondary antibody. The ABC system followed by the DAB were used for development. All tissues were counterstained with hematoxylin. 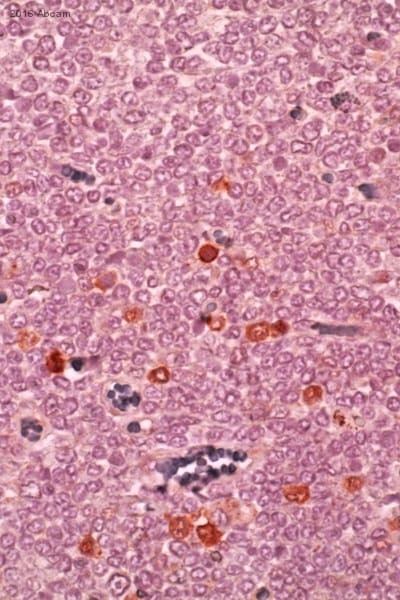 Immunocytochemistry/Immunofluorescence analysis of Raji (Human Burkitt's lymphoma cell line) labelling CD86 with purified ab53004 at 1/500. Cells were fixed with 4% PFA and permeabilized with 0.1% triton X-100. 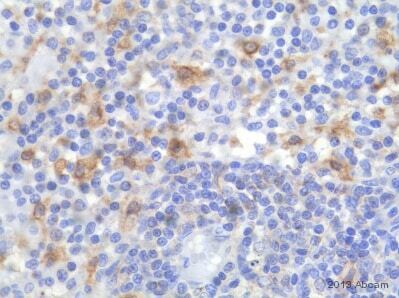 ab150077 Goat anti rabbit IgG (Alexa Fluor® 488) at 1/1000 was used as the secondary antibody. 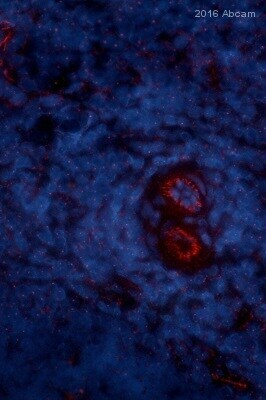 Nuclei were counterstained with DAPI. PBS was used instead of the primary antibody as the negative control. Primary antibody, ab53004 was used at concentrations between 0.1 - 1000 ng/ml. An Alkaline Phosphatase Goat Anti-Rabbit IgG (H+L) was used as the secondary antibody at 1:2500 dilution. Antigen concentration was 100ng/ml. 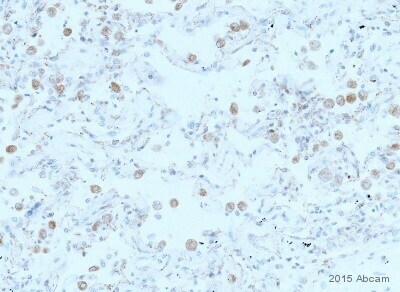 ab53004 staining CD86 in cynomolgus monkey lymph node tissue sections by Immunohistochemistry (IHC-P - paraformaldehyde-fixed, paraffin-embedded sections). Tissue was fixed with formaldehyde and blocked with 10% serum for 20 minutes at room temperature; antigen retrieval was by heat mediation in a citrate buffer, pH 6.0. Samples were incubated with primary antibody (1/800) for 30 minutes at room temperature. An undiluted biotin-conjugated Goat anti-rabbit IgG polyclonal was used as the secondary antibody. 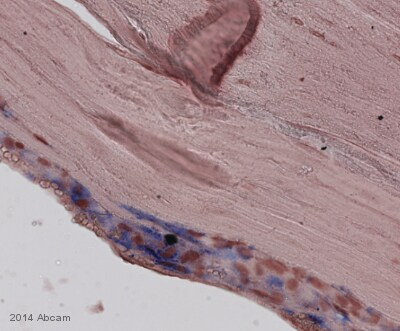 ab53004, at a 1/100 dilution, staining human CD86 in tonsil tissue, using Immunohistochemistry, paraffin embedded tissue. Publishing research using ab53004? Please let us know so that we can cite the reference in this datasheet.